Jump ToComic #1Comic #2Comic #3Comic #4Comic #5Comic #6Comic #7Comic #8 - WOW!Comic #9 - Meli's PostComic #10 - RelentlessComic #11 - PandoraComic #12 - Manpan CaveComic #14 - Board Game FridayComic #15 - PerformancesComic #17 - RevoltComic #18 - Video PerkComic #19 - FAWM.ORGComic #20 - #TotoroTuesdayComic #21 - "Comeback"Comic #22 - "Winning a game"Comic #23 - "Uncouth"Comic #24 - "Highschool Rejections"Comic #25 - "Someone New"Comic #26 - "Critic"Comic #27 - "Saggle"Comic #28 - "Weekend Plans"Comic #29 - "Resistance"Comic #30 - "The Internet"Comic #31 - "School"Comic #32 - "Breakfast Conversations"Comic #33 - "New Hobbies! 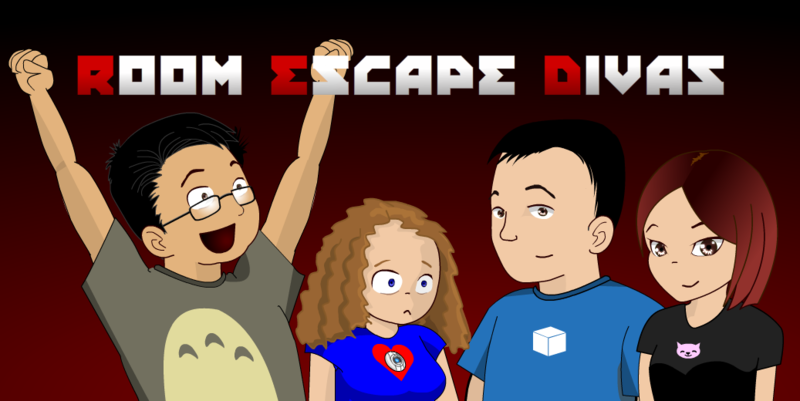 "Comic #34 - "Escaping"Comic #35 - "Clues"Comic #36 - "Altercation"Comic #37 - "Deja Vu"Comic #38 - "We Escaped! "Comic #39 - "New Friends! "Comic #40 - "Meeting EGR"Comic #41 - "TEAM TOTORO! "Comic #42 - "Mr. Mingles"Comic #43 - "Leezet's Birthday"Comic #44 - "Chatting Escapes"Comic #45 - "Season Three"Comic #46 - "Cross Country Skiing"Comic #47 - "Funny"Comic #48 - "Puzzles"Comic #49 - "Sick"Comic #50 - "False King"Comic #51 - "Bento"Comic #52 - "Farewell Concert"Comic #53 - "Drilliens"Comic #55 - "Small Party"Comic #56 - "LockQuest"Comic #57 - "Dark"Comic #58 - "The Saint"Comic #59 - "Will"Comic #60 - "Sacrifice"Comic #61 - "Doubt"Comic #62 - "Ekko Draws"Comic #63 - "Puzzle Hints"Comic #64 - "Puzzle Hunt"Comic #65 - "Puzzle Discovery"Comic #66 - "Evening Plans"Comic #67 - "Steganography"Comic #68 - "Directions"Comic #69 - "Ukuleleist"Comic #70 - "Insulted"Comic #71 - "Conscripting"Comic #73 - Guest Comic by David ProfitComic #74 - "Not Mandy"Comic #76 - "TARDIS Dress"Comic #77 - "TARDIS Dress Complete"Ekko's Semi-FormalComic #78 - "Sentiment"Comic #79 - "Final Puzzle"Comic #80 - "Car Trips"Comic #81 - "Car Conversations"Comic #82 - "Ja-mez"Comic #83 - "Frustration"Comic #84 - "Portrayal"Comic #85 - "Gardens"Comic #86 - "Bunny"Comic #87 - "Busy Week"Comic #88 - "Opposites"Comic #89 - "Bus Driver Bob"Comic #90 - "Puzzled Pint"Comic #91 - "Puzzle Mode"Comic #92 - "Traffic"Comic #94 - "No Parents"Comic #95 - "Quiet Drive"Comic #96 - "Non-Errol Gaming"Comic #97 - "Escape Room Arrival"Comic #98 - "Need the Funny"Comic #99 - "Wings Date Night"Comic #100 - "The World"Comic #101 - "Good Comic"Comic #102 - "Hey, Let's Go! "Comic #103 - "Father's Love"Comic #104 - "Next Hunt"Comic #105 - "More Comics"Comic #106 - "New Glasses"Comic #107 - "Walk"Comic #108 - "Bathing Suits"Comic #109 - "Debates"Comic #111 - "Check the Comments"Comic #112 - "Comment Convos"Comic #113 - "Walking to Work"Comic #114 - "Zoe's Performance"Comic #115 - "Mother's Day"Comic #116 - "Breakfast for Mommy"Comic #117 - "Flowers for Mommy"Comic #118 - "Bread"Comic #121 - "Survive"Comic #122 - "Quiet House"Comic #123 - "Calgary"Comic #124 - "Busy Again"Comic #125 - "Airport Security"Comic #126 - "Seating"Comic #127 - "Leezet IRL"Comic #128 - "First Escape"Comic #130 - "Hint"Comic #131 - "Thoughts"Comic #132 - "Forgot"Comic #133 - "Arc Ends"Comic #134 - "EscRoomAddict"Comic #135 - "Sisters"Comic #136 - "Irises"Comic #137 - "Resurrected Chat"Comic #138 - "Old Meets New"Comic #139 - "More Shopping"Comic #140 - "Miss Granny"Comic #141 - "Mother Fail"Comic #142 - "New Dress"Comic #143 - "Escape Room Planning"Comic #144 - "Mario Party"Comic #145 - "Staying Home"Comic #146 - "Hey, Let's Go! "Comic #147 - "Local Multiplayer"Comic #148 - "Wrong"Comic #149 - "Co-op"Comic #150 - "Where's Manpans"Comic #151 - "Bruise"Comic #152 - "Lazy"Comic #153 - "Kung Fu Princess"Comic #154 - "Graduations"Comic #155 - "Moving"Comic #156 - "Bus Ride"Comic #157 - "Scary"Comic #158 - "Lasers"Comic #159 - "TTC Woes"Comic #160 - "Chinese Dinner"Comic #161 - "Braggarts"Comic #162 - "Cast Page"Comic #164 - "Car Convos Again"Comic #165 - "Jealousy"Comic #166 - "Gel Pen"Comic #167 - "Canada Day! "Comic #168 - "New Versions"Comic #169 - "Mining for Content"Comic #170 - "Daily Requests"Comic #171 - "Lazy Saturday"Comic #172 - "Boyfriend Advice"Comic #173 - "Bachelor Week"Comic #174 - "Bachelorhood - Day 1"Comic #175 - "Binging"Comic #176 - "Embarrassed"Comic #177 - "Full Day"Comic #178 - "Script"Comic #179 - "They're Back! "Comic #180 - "Rice"Comic #181 - "Bad Night"Comic #182 - "Family Night"Comic #183 - "Week Alone"Comic #184 - "Fries"Comic #185 - "Batman Hat"Comic #186 - "Off to Camp"Comic #187 - "Week Plans"Comic #188 - "Willingingly"Comic #189 - "Softball Tonight"Comic #190 - "Outfield"Comic #191 - "Personality Test"Comic #192 - "They're Home"Comic #193 - "Alana & Emma"Comic #194 - "Getting Work Done"Comic #195 - "Meet Up"Comic #196 - "Mouse Hiding"Comic #197 - "Book Launch"Comic #198 - "Great Wall"Comic #199- "Vacation"Comic #200- "Melon Balls"Comic #201- "Melon Work"Comic #202- InnacuraciesComic #203- "Bye Bye, Cousins"Comic #204- "Internet"Comic #205- "Montage"Comic #205- "Return"Comic #207 - "Ruined"Comic #208 - "Portrayal"Comic #209 - "Lunch Talks"Comic #210 - "Escape Room Roles"Comic #211 - "Weekend Alone"Comic #212 - "Campfires"Comic #213 - "Camp Meals"Comic #214 - "Back from Camping"Comic #215 - "Morning Bus Rides"Comic #216 - "Ekko Leaves"Comic #217 - "Rock, Paper, Cynic"Comic #218 - "Delayed Flight"Comic #219 - "Beach Party"Comic #220 - "Book Shopping"Comic #221 - "Ekko Letter"Comic #222 - "Family Visits"Comic #223 - "Movie Night"Comic #224 - "Bedtime Story"Comic #225 - "Ekko's Home"Comic #226 - "Geek Nights"Comic #227 - "Late Comic"Comic #228 - "Frittata"Comic #229 - "Linux"Comic #230 - "Super Dad"Comic #231 - "Lunch"Comic #232 - "Solving Machine"Comic #233 - "Ending Series"Comic #234 - "Birthday Gift"Comic #235 - "Where's Mom? "Comic #236 - "I'm in Trouble..."Comic #237 - "Birthday Plans"Comic #239 - "First Day of School"Comic #239 - "Good Morning"Comic #240 - "Morning Swim"Comic #241 - "Lazy Saturday"Comic #242 - "Birthday Cleanliness"Comic #243 - "TV Too Loud"Comic #244 - "Face"Comic #245 - "Ekko's Story"Comic #246 - "Dresses"Comic #247 - "Speakeasy Night! "Comic #248 - "Speakeasy Done! "Comic #249 - "Survey Says"Comic #250 - "Weekend Rituals"Comic #251 - "Judge"Comic #252 - "Periscope"Comic #254 - "Zoe Conversations"Comic #255 - "Friday Night Dates! "Comic #256 - "Project Prep"Comic #257 - "Fight! "Comic #258 - "Typecast"Comic #259 - "Roles Given"Comic #260 - "Morning Dances"Comic #261 - "School Chats"Comic #262 - "New Glasses"Comic #263 - "Run for the Cure"Comic #264 - "Thump Thump! "Comic #265 - "Friends"Comic #266 - "The Mommy Dances"Comic #267 - "School Trip"Comic #268 - "Need Six Comics"Comic #269 - "Calgary Vacation"Comic #270 - "Backup Comics"Comic #271 - "Multi-Tasking"Comic #272 - "Who Wants Ponies? "Comic #273 - "Future Hopes"Comic #274 - "New Computer! "Comic #275 - "Up Late"Comic #276 - "New Glasses"Comic #277 - "Anime"Comic #278 - "Editor"Comic #279 - "Guilt"Comic #280 - "Kristi's Blog"Comic #281 - "Facts of Life"Comic #282 - "Boardgame Night"Comic #283 - "Score Update"Comic #284 - "Personality"Comic #285 - "It Starts! "Comic #286 - "Escape Room Unconference"Comic #287 - "Flashback"Comic #288 - "Plays"Comic #289 - "Airport Check In"Comic #290 - "Hurry"Comic #291 - "International Flights"Comic #292 - "Missing Passport"Comic #293 - "Exchange"Comic #294 - "Relief"Comic #295 - "Luggage"Comic #296 - "Coming Home"Comic #297 - "Double Up Day"Comic #298 - "Bacon Mornings"Comic #299 - "Parenting Chores"Comic #300 - "Comic Secrets"Comic #301 - "Comic Reading"Comic #302 - "Private Discussions"Comic #303 - "My Own Room"Comic #304 - "Weekend Time! "Comic #305 - "Diva"Comic #306 - "Joy of Parenting"Comic #307 - "Funny Story"Comic #308 - "Report Cards"Comic #309 - "Inheritance"Comic #310 - "Behind on NaNo"Comic #311 - "Bus Texts"Comic #312 - "Comic Help"Comic #313 - "Guest Room Takeover"Comic #314 - "Piano Lessons"Comic #315 - "Elephant Song"Comic #316 - "Updates"Comic #317 - "Lunch"Comic #318 - "Remember"Comic #318 - "Monster"Comic #321 - "Living Room Noise"Comic #322 - "Freedom"Comic #323 - "ToNaNo TGIO"Comic #324 - "Snacks"Comic #325 - "Skating"Comic #326 - "3 vs 1"Comic #328 - "My Neighbour Zoe #1"Comic #329 - "Guest Comic by Ekko"Comic #330 - "Art Night"Comic #331 - "The Show"Comic #332 - "Crying"Comic #333 - "Immortal Privilege"Comic #334 - "Zoe's Going! "Comic #335 - "Emergencies"Comic #336 - "Leaving Today"Comic #337 - "First Day"Comic #338 - "Mornings Without Mommy"Comic #339 - "Spoilers"Comic #340 - "Supplies Are Low"Comic #341 - "Nutrition"Comic #342 - "Girls Gone"Comic #343 - "Knitting Presents"Comic #344 - "Knitting Presents"Comic #345 - "Merry Christmas"Comic #346 - "Favourite Daughter"Comic #347 - "The Spoiler Awakens"Comic #348 - "Deductions"Comic #349 - "Leezet Needs Friends"Comic #350 - "OFLF Day 2"Comic #351 - "OFLF Day 3"Comic #352 - "Happy New Year"Comic #353 - "Favourite Memories"Comic #354 - "First Day"Comic #355 - "Memories Part 2"Comic #356 - "High Stress"Comic #357 - "Ponyo Lyrics"Comic #358 - "Batteries"Comic #359 - "Lunchtime"Comic #360 - "Guests"Comic #361 - "Ruby & Mike"Comic #362 - "Zoe & Board Games"Comic #363 - "Power Outage"Comic #364 - "Comments"Comic #365 - "Late Night"Comic #366 - "Ichiya"Comic #367 - "Manpan Visit"Comic #368 - "Late Weekend"Comic #369 - "Loud Dinner"Comic #370 - "Broken Computers"Comic #371 - "Drawing Hobbies"Comic #372 - "Jackie Chan is Awesome"Comic #373 - "Solved Everything! "Comic #374 - "Zoe's Here! "Comic #375 - "Quiet Night"Comic #376 - "Teeth Brushing"Comic #377 - "Babysitting Offers"Comic #378 - "R2-D2 Planes"Comic #379 - "Not a Quiet Night"Comic #380 - "Vacations"Comic #381 - "Party All the Time"Comic #382 - "Uncle Errol"
Mike and Ruby, if you are unaware, run a blog about Escape Rooms called Escape Games Review. They came over for boardgames to celebrate both their birthdays which happened in the last month! Huzzah! Manpans joined them to form team ManYuans against Team Elumir! We played for nine hours!! hahahah Ruby looks like a cat.. love it.